Climate change was a key ingredient in the collapse of the ancient Harappan civilization almost 4,000 years ago, a new study suggests. 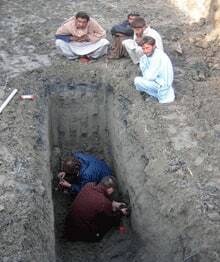 The Harrapans once occupied more than one million square kilometres of the plains of the Indus River in what is now a vast desert region that includes parts of Pakistan, northwest India and eastern Afghanistan. The civilization extended from the Arabian Sea to the Ganges River and was the largest of the early urban societies along with those of Egypt and Mesopotamia. An international, interdisciplinary team of geologists, archeologists, mathematicians and geomorphologists collected samples from the area once occupied by the little-known civilization over a period of five years and reconstructed the landscape and topography of the area. "Once we had this new information on the geological history, we could re-examine what we know about settlements, what crops people were planting and when, and how both agriculture and settlement patterns changed," co-author Dorian Fuller, an archaeologist with University College London, said in a news release. 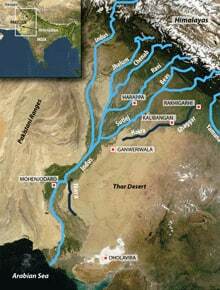 The researchers' analysis suggested that climate change that weakened monsoon rains and tamed the tributaries of the Indus River and reduced run-off from the Himalayan mountains enabled the Harappans to practice agriculture on the river banks. But when monsoon rains began to decline, the rivers and regular flooding the civilization relied on to maintain a strong agriculture dried up, and they were forced to move east toward the Ganges River basin and were no longer able to sustain large cities. The findings were published last month in the journal Proceedings of the National Academy of Sciences. Listen to the lead author of the study, geologist Liviu Giosan of the Woods Hole Oceanographic Institution, discuss the research with Bob McDonald of CBC's Quirks & Quarks.